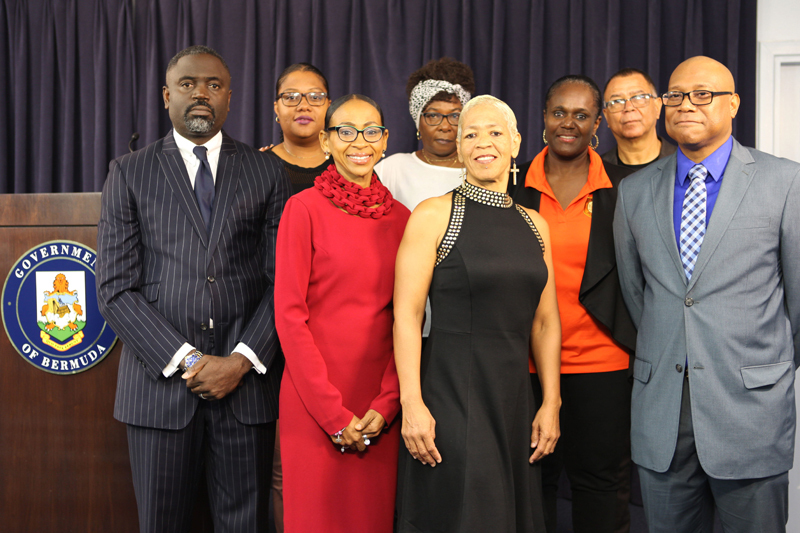 Minister of National Security Wayne Caines and the MOM Chairwomen held a press conference today [Oct 19] providing an introduction and an update on Mothers on a Mission [MOM]. Minister Caines said, “I am pleased today to introduce an initiative that is targeted at support, restoration and healing. This community is very familiar with the statistics of crime and the result of violence in Bermuda. Beyond the numbers is a human element that must be addressed. “We must support those impacted directly by violence and restore their spirits to a place where growth and development is again possible. “As a part of the Ministry of National Security’s promised holistic approach to the issues presented by violence in the community, we assisted in the convening of Mothers on a Mission or MOM Bermuda. These women share a tragic bond having lost a son to violence. Dee-Ah Iris and Nicole Fox, who have both lost sons to violence, serve as the co-chairpersons of Mothers on a Mission, and both spoke at today’s press conference. I am pleased today to introduce an initiative that is targeted at support, restoration and healing. This community is very familiar with the statistics of crime and the result of violence in Bermuda. Beyond the numbers is a human element that must be addressed. We must support those impacted directly by violence and restore their spirits to a place where growth and development is again possible. As a part of the Ministry of National Security’s promised holistic approach to the issues presented by violence in the community, we assisted in the convening of Mothers on a Mission or MOM Bermuda. These women share a tragic bond having lost a son to violence. Although united by tragedy they have come together to support one another; to deal with their grief and to lift up their communities through their efforts at reconciliation and forgiveness. I wish to thank all of those who are involved in this initiative under the leadership of Dee-AH Iris and Nicole Fox and the able support of the Ministry’s team led by Vernon Wears Jr. and Pastor Leroy Bean. This country must heal; and our responsibility as leaders is to facilitate that healing. This Government is determined to promote activities that will break the cycle of the systemic origins of violence in this community. MOM Bermuda is one such entity dedicated to this process and our aim is to support those who will join for a common purpose in lifting up people. We promised to be a government for the people and this initiative has the potential to empower communities, acting as a means to inspire those who have suffered and to prevent further violence. Restored people can rebuild lives. My name is Dee-Ah Iris and I am the chairperson for the Mothers on A Mission Bermuda [MOM Bermuda] and with me is the co-chair, Nicole Fox and other members of MOM Bermuda. “This group was formed at the request of Minister Wayne Caines, during a community forum hosted during the summer, by the founder of Visionz, Desmond Crockwell, to address the outcry of the steady increase of violence amongst our men. “The Core Group consists mainly of mothers who have lost their sons to violence, their support person [family member or friend], professional counselors who provide emotional support, and Ministry Representatives. for all of your support and guidance over the last few months. MOM Bermuda are a group of women, along with their families and support person[s], affected by violence in Bermuda, who are dedicated to bringing peace into their lives and into the community, through support, love, education, empowerment and forgiveness. Live in peace, not in pieces! Support – A safe forum is provided for each person to express their grief and concerns, with trained counselors, to aid the healing process and to further the restoration process. Love – We seek peace and unity by embracing all of those in the community who have been impacted by the violence in Bermuda and endeavor to mend and build relationships based on love, tolerance and respecting each other’s differences. Education – Training is provided on a monthly basis on topics that are relevant to grieving mothers, their families and their support person[s] including the community at-large, where applicable. Empowerment – Each person is validated and given the opportunity to share their talent, knowledge or expertise to further our cause. Forgiveness – We start the reconciliation process by facilitating the uniting of both the victim’s mother and the perpetrator’s mother to be the example we would like to see in our community. Set the ball in motion to create the first male support group for grieving men who have lost sons, nephews, brothers, cousins and friends, to acts of violence. We have been in talks with the Bermuda Police Service to express our concerns around community safety. Provided free professional grief counseling to impacted family members who desired this much needed counseling but lacked resources. We have been chosen to be part of the grief and loss assessment that will be facilitated by Comfort Zone in partnership with the Champions program, the first of its kind in Bermuda. End of November 2017 – Host the MOM Bermuda Kick-off with “The Power of the Call” Seminar. We will continue to have educational seminars related to Grief support on a monthly basis. Mid-December 2017 – Hold two support groups, one for men and one for women, held in 3 locations [East, West, and Central]. They will meet weekly to share their experience, strength and hope and to be encouraged. January 2018 – Attend Restorative Justice training, a 6 week training course which will provide tools to assist with healing, forgiveness and uniting our community, one relationship at a time. May 18- 20, 2018 – Attend the Circle of Mothers Retreat hosted by the Trayvon Martin Foundation. Anyone who is interested in joining MOM Bermuda may do so by contacting us on 704-6355 or 331-9172. You can also email us at mombermuda@gmail.com. Gina Spence is NOT a doctor. She has an honorary Doctorate!! The courses she took must have been intense. Is that better than a diploma mill phd? This was a great touching press conference. Who feels it know it. And these people certainly know it. Why is this only mothers? Also most of the action points seem to be about dealing with Moms after they have experienced these tragic losses, nothing about averting them. Respect to the Moms but we need to address WHY these kids are dying and WHAT has to be done. They said that there will be a fathers group formed as well. sometimes people are more open in groups with like people and are able to open up with the same empathy. There is nothing to say the two (or more) groups will not meet together or work together. The kids are dying because of GANGS and the consequences of living that life. WHY do they join gangs? WHY is their father not involved in their life? WHY are they hanging out on the streets when others are playing football? All important questions with complicated answers. These women are offering support for each other, because they have been victims. It all starts at home when they are not given the attention and love they need and deserve. The excuse that “I am a single parent” does not work anymore. You can be a single parent and devote your time and energy to your children. They are looking for attention/love elsewhere – hence they turn to gangs. I know of one child that is not getting any attention from their parent and he has turned to gang activity as a result. Parents need to step up! I was able to raise my children even though I am a single parent – why can’t others – it takes time, patience, sacrifice and lots of love but the results are worth it all. why you didn’t show no love ya self then? Well said. Could not agree more. I perhaps part of the problem is that many of these ‘parents’ are barely more than children themselves. Grandparents in their 30′s and 40′s are out at work themselves and unable to help, although no excuse for not teaching a child where to find their moral compass.